Autumn 1969: principal photography was underway on UFO at MGM Borehamwood Studios, Universal Pictures was readying Doppelgänger for its theatrical release and on 21st September the last Supermarionation series – The Secret Service – would receive its broadcast premiere on ATV in the Midlands. Fifty years on, and fans of Gerry and Sylvia Anderson’s iconic creations will be celebrating this and more – including their other amazing visions of the future Stingray, Thunderbirds, Captain Scarlet And The Mysterons, Space:1999 – at Supercelebration, Fanderson’s convention for 2019. For convention details and the latest updates, keep an eye on www.fanderson.org.uk. Join us at Supercelebration – Fanderson’s weekend of events celebrating 50 years of UFO, Doppelgänger, The Secret Service and more. Catch up with old friends and make new ones; hear from the people who made our favourite programmes; add to your autograph collection; marvel at original and studio-standard replica models, puppets and costumes; get into the nitty-gritty in our interactive workshops; browse our gallery of stunning artwork; catch an episode or two, or rare screenings. And be ready to transport all the goodies you’ll be taking home from Fanderson Sales and our traders. The weekend will include a sparkling celebratory reception, but you’ll need a clear head to take in all there is to see and do in a packed convention. Find time to recharge your batteries for our Saturday night Supercelebration disco. The Supercelebration disco will be full of the very best music, and the best Anderson characters as we’re hoping everyone will get into the spirit with an Anderson-themed fancy dress outfit. All we ask is that your costume isn’t an off-the shelf number, and that you’ve not worn it at a Fanderson event before. We’ll have prizes for the best costumes. 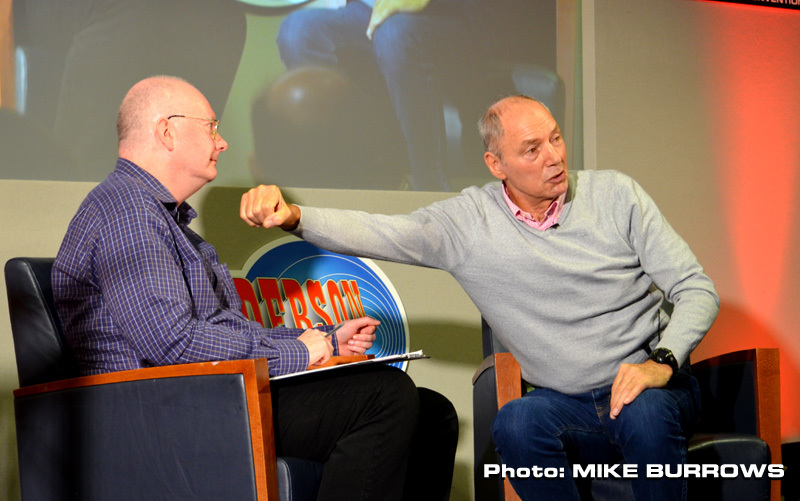 We’re inviting a long list of guests from Gerry and Sylvia Anderson’s productions to join you at Supercelebration. Fanderson has a great track record of raising funds for charities including The Alzheimer’s Society, BBC Children In Need, Breast Cancer Care, Cinema and Television Benevolent Fund. Macmillan Cancer Support, Terrence Higgins Trust, Guide Dogs For The Blind and Diabetes UK. We’re asking everyone who books a place (or supporting package) at Supercelebration before 1st June 2019 to let us know the charity that they would like us to consider as the convention charity. Put your preference in the ‘special instructions’ box when you checkout on our website, or in the appropriate box on the PDF booking form. We’ll have lots of goodies in our live auctions, silent auctions and raffles during the weekend. No matter your budget, everyone will have the chance to leave Supercelebration with something very special, and raise important funds for our convention charity. The popular Holiday Inn, Maidenhead is once again our venue for Supercelebration, following excellent feedback from our The Future Is Fantastic! event in 2015 and Special Assignment in 2017. Reservations can be made from 5th October. It’s set in a residential area one mile from Maidenhead town centre and has a complimentary car park for residents. The health club includes a large swimming pool, children’s pool, whirlpool, sauna, steam room and two gyms. The restaurant serves seasonal dishes as well as classics like steak and pasta, and there’s 24-hour room service. There is also a very large open plan cocktail bar that serves bar snack meals and is great for socialising. Rooms at the Holiday Inn are available to delegates at the special rate of £100 per standard double room/per night (bed and breakfast) whether for single or double occupancy. Just call 01628 506070 in normal office hours (9:00-17:00 Monday to Friday) and quote the reference ‘Fanderson’. As a fan-organised event, the earlier everyone books for Supercelebration, the earlier we know how extravagant we can be in staging the show. Tickets start at just £55 per person for one day, or £90 for the whole weekend. We’ve managed to keep the price the same as our Special Assignment convention in 2017 because we’re a fan club and no-one is taking a salary. Every penny you pay for your place goes into staging the event. Ticket prices will rise on 1st January 2019. Book your place(s) online now or, if you’d prefer to pay by UK cheque or postal order, print and complete the registration form and return it to us with your payment. 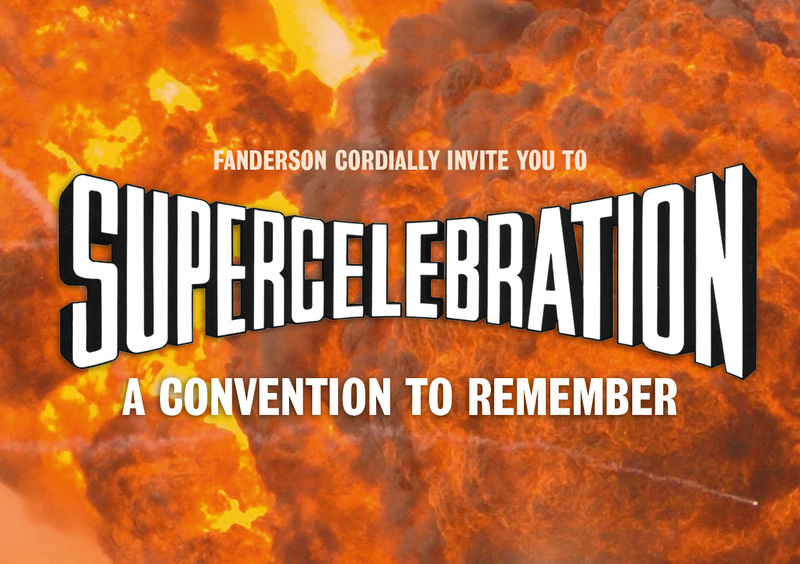 If you’re not already a Fanderson member (even if you’re coming along with a Fanderson member) you must apply for a trial member’s place at Supercelebration, which includes a sample membership at a special price of £10. This will start when you arrive at the convention and run until 31st December 2019. It will include the latest issue of the club’s FAB magazine, membership badge, enable you to buy our merchandise at the convention at special prices, access our full range of merchandise online and access to the members’ area of the Fanderson Forum. Not able to be with us in person? 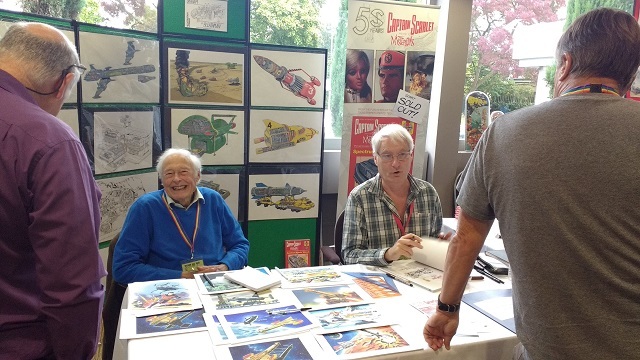 If you’re a trader or licensee who’d like the opportunity to sell your merchandise to fans of Gerry and Sylvia Anderson’s work (or even a club member who wants some of your collection to go to a good home) you can buy tables in our Supercelebration Traders’ Room. Each table is approximately 1m x 2m and permits one person to attend that table (so, for two people at your table, you’ll need to buy two tables etc). A Trader’s table doesn’t give you access to the main convention areas. Supercelebration is being staged by Fanderson. The world’s only official Gerry and Sylvia Anderson appreciation society, Fanderson is endorsed by ITV Studios Global Entertainment, Anderson Entertainment, Gerry Anderson Productions, ITC Entertainment Group and the family of Sylvia Anderson. Based in the UK, with over 1,300 members worldwide and run by a small unpaid committee of fans, Fanderson was formed in 1981 from several small clubs at the request of ITC Entertainment and Gerry Anderson, so that they could support a single independent fan body for all Anderson productions. This information was correct at the time of going to press, but does not constitute a contract to supply any of the attractions mentioned, nor a definitive timetable. Convention images are from previous Fanderson events and do not necessarily represent everything you’ll be enjoying at Fanderson’s Supercelebration. By booking any places at Supercelebration, you are agreeing to the below, in addition to Fanderson’s standard terms and conditions on the Fanderson Forum. You’ll automatically receive confirmation of your order if you book online at www.fanderson.org.uk, or by e-mail if you use this form and include your e-mail address. If you’d prefer us to send a hard-copy acknowledgement of your order, please enclose a stamped self-addressed envelope with your completed form. It is your responsibility to book and pay for your own accommodation and any associated costs, or to pay any cancellation costs due to your failure to attend the event. The convention committee and/or the hotel reserve the right to decline registration for any reason whatsoever and, should your application for registration be declined, any registration fees that you have paid will be refunded in full. Any children in your party are your sole responsibility for the duration of the convention, and that the organisers will not make any special arrangements for children of any age. The organisers will make every effort to provide you with the contents of the programme of events as described, but changes to the programme may be implemented at the organisers’ discretion due to unforeseen circumstances that may arise nearer the date of the event. The organisers cannot control the taking of personal photographs and/or video footage which includes delegates at Supercelebration, and by booking a place at Supercelebration delegates consent to such photographs and/or footage being used to promote Fanderson and/or its products and services. Fanderson staged its first convention in two years at the Holiday Inn Maidenhead over the weekend of 29th September – 1st October. 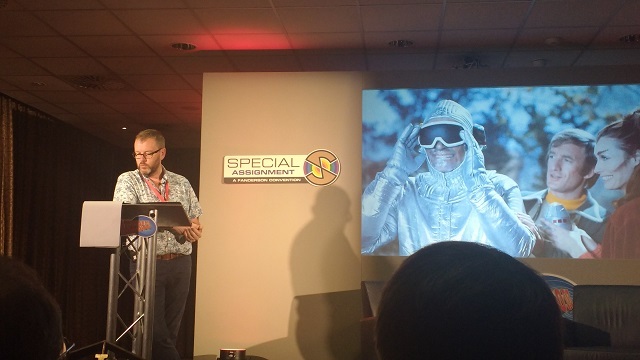 Special Assignment was designed to mark the 50th anniversary of the Andersons’ iconic Captain Scarlet and the Mysterons, but as an event it turned out to be so much more than a homage to a single show. 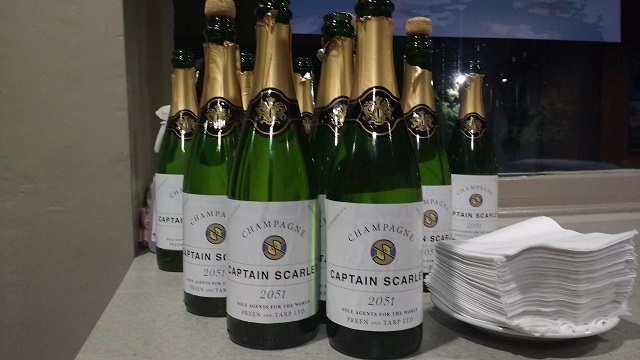 Special Assignment started with a bang on Friday night, as guests assembled for a bucks fizz reception at 8pm, with bottles featuring specially designed Captain Scarlet commemorative labels. 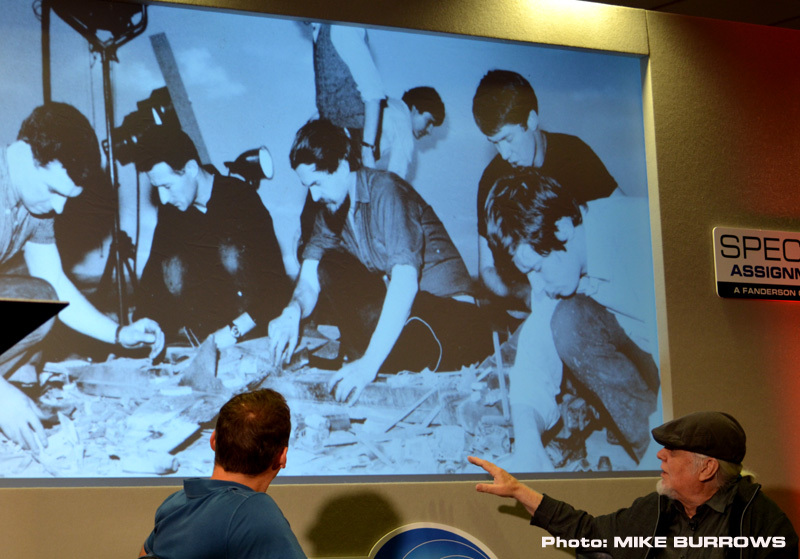 After a toast to the series, fans settled down to a screening of the first episode, The Mysterons, first shown on ATV 50 years ago to the day, in the ‘Cloudbase Theatre’ (a.k.a the main features room). Fans were then treated to a surprise re-creation of the Captain Scarlet-themed episode of The Golden Shot game show that aired back in 1968, complete with faithful replicas of the original targets. 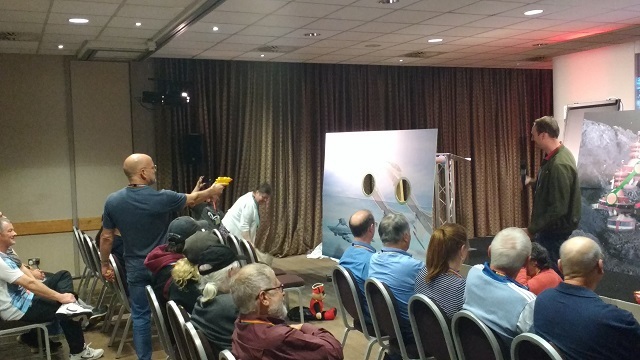 The competition was enthusiastically compered by Fanderson co-editor/designer Mike Jones, and prizes were on offer to anyone who wanted to prove they were a deadeye marksman with a nerf gun. The evening entertainment continued on Saturday night, with the main features room reset for the traditional Fanderson hot fork buffet. 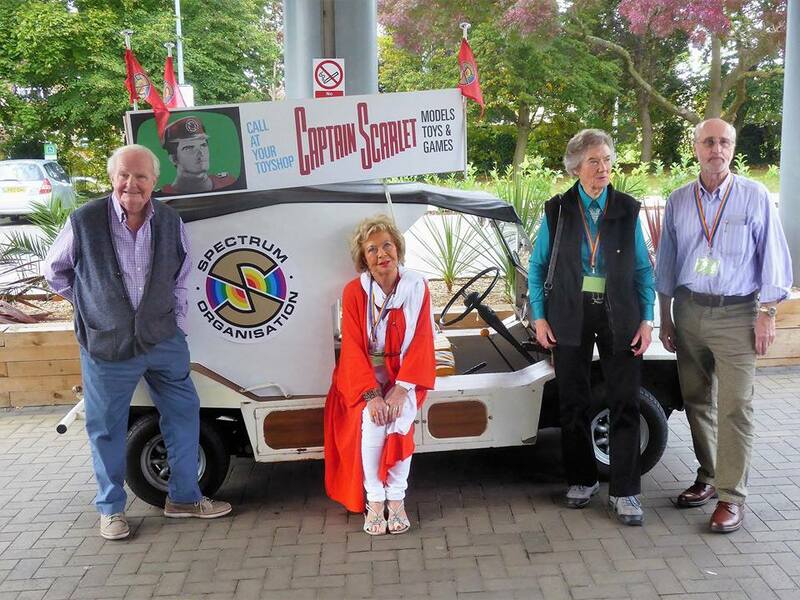 Some creative souls really dressed for the occasion, and Captain Scarlet, Colonel White, Lieutenant Ellis, Tin-Tin, Lady Penelope and an Alien could be seen sitting down to dinner among the other delegates. After the meal, Nick Williams ran a cult TV quiz that featured a round on regional TV network logos and tested powers of observation as well as trivia knowledge. Perhaps most importantly, the quiz was less fiendishly difficult than the one held at The Future Is Fantastic! in 2015. Yet another sign that the club listens to feedback! After the quiz, some fans retired to the bar into the small hours while others sloped off to bed. The convention was blessed with a wide range of guests who generously have up their free time to talk about their work for the Andersons. Liz Morgan, who voiced several of the Angels, provided a fitting link to the original Captain Scarlet series. She was joined on Saturday by the unmissable Thunderbirds duo of David Graham and Shane Rimmer to discuss the challenges of emoting with puppets. 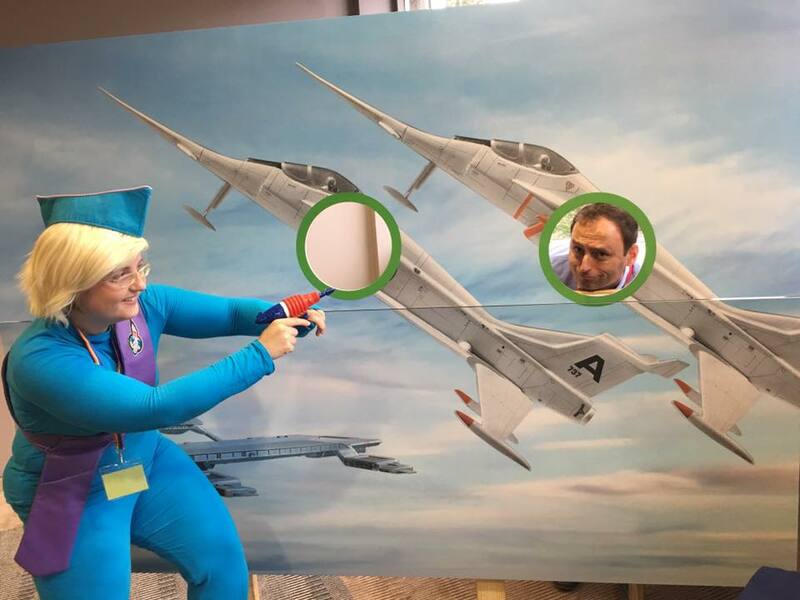 Later, in a meeting of ‘old’ and ‘new’ Captain Scarlet voice artists, she was teamed up with Wayne Forrester and the hugely popular Thunderbirds voice artist Matt Zimmerman. The Captain Scarlet link continued in another three-way interview with Dominic Lavery, Mark Woollard and once again Wayne Forrester, who was an 11th hour guest, discussing the troubled production of New Captain Scarlet. 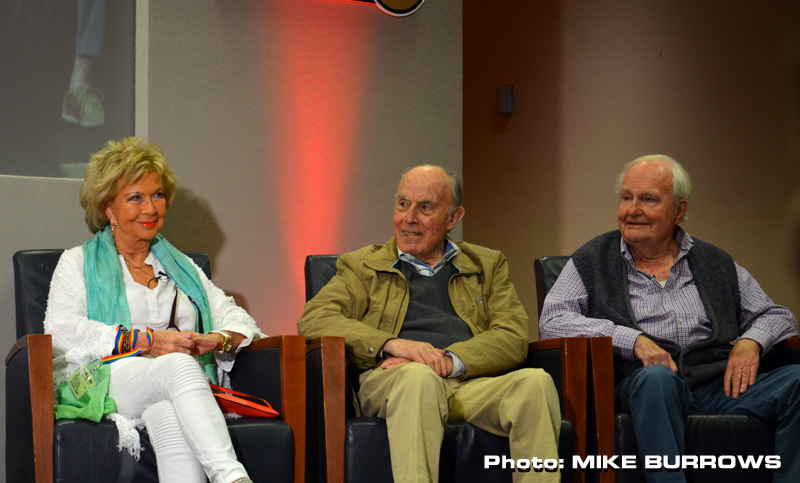 Special Assignment featured a number of first-ever appearances at a Fanderson convention. SHADO women Penny Spencer and Georgina Moon were interviewed about their time on UFO, while Richard Culley provided a fascinating insight into the merchandising arm of Century 21. Perhaps the most entertaining guest appearance was stunt double and co-ordinator Paul Weston, who worked not only on Space:1999 and The Protectors, but a long list of films including the Bond franchise. Taking a brief break from book illustrations and signings in the foyer, Mike Noble and Graham Bleathman teamed up to talk about their work illustrating TV21 and the 1990s Fleetway Thunderbirds Comic, while Mary Turner and Judy Preece talked about their experiences with puppets on the Supermarionation series and Terrahawks. The focus returned to Terrahawks later in the weekend when Terry Adlam, John Lee and Steve Begg were reunited to discuss their work on the series and beyond. 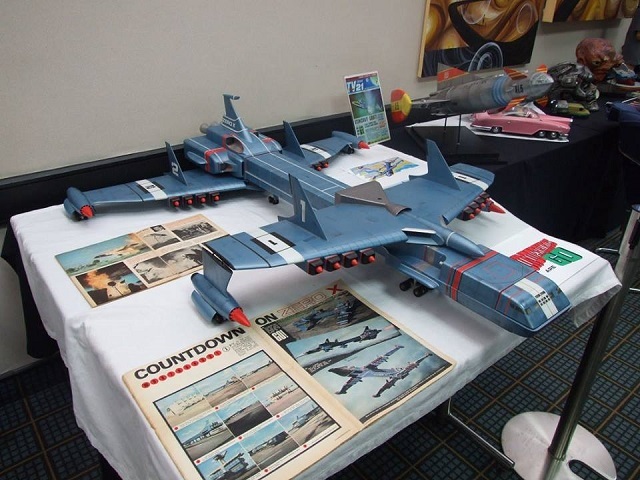 Model maker Martin Bower gave two fascinating slide presentations over the weekend, revealing some of the secrets of his work on Space:1999, the Fleetway comics and other projects. Meanwhile, Peter Hitchcock had traveled all the way from Canada to attend and gave the fans great value with two sessions. On Saturday he delivered a special effects presentation that focused on specialist Supermarionation techniques such as electronic lip-syncing, then on Sunday he teamed up with Brian Johnson to talk more widely about their work at AP Films. After that, Alan Shubrook and Mike Trim then picked up the thread with a double-header interview that covered their work on the later Century 21 era. Beyond the guest interviews and evening entertainment, Special Assignment will be remembered as the premiere for a wealth of fabulous Anderson merchandise celebrating Scarlet’s golden anniversary. 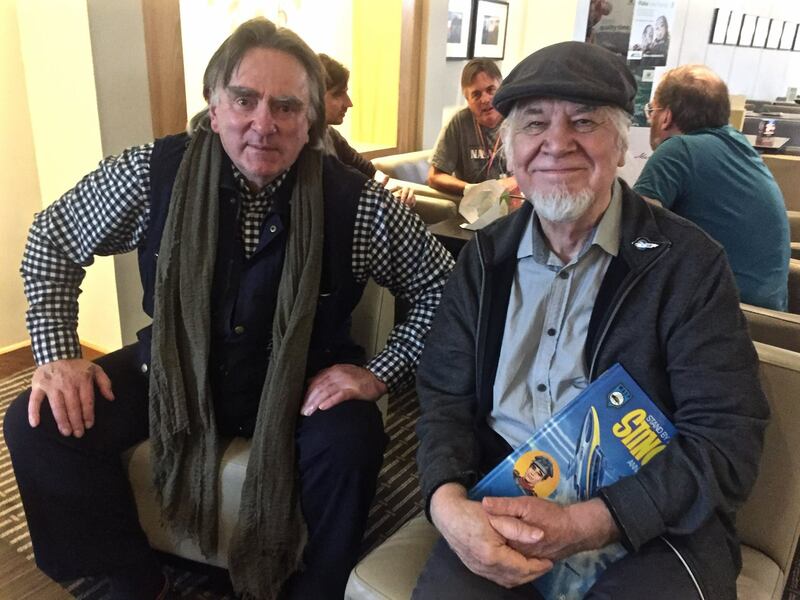 Author and ex-club chairman Chris Bentley and publisher Marcus Hearn were present in ‘Harman’s Department Store’ traders’ room to greet fans and sign copies of a limited edition black version of Captain Scarlet: The Vault. Robert Harrop also chose an alternative colour to mark the anniversary, releasing a Captain Ochre figurine, along with a Martian Pete from the Thunderbirds episode Martian Invasion. Big Finish were selling their comprehensive boxed set of Century 21 Captain Scarlet mini albums, as well as a new audio adaptation of the John Theydon novel, Captain Scarlet And The Mysterons. Big Chief were promoting their lavish new Captain Scarlet figurine, while Graham Bleathman was signing copies of his long-awaited Captain Scarlet Haynes Manual, written by Sam Denham. 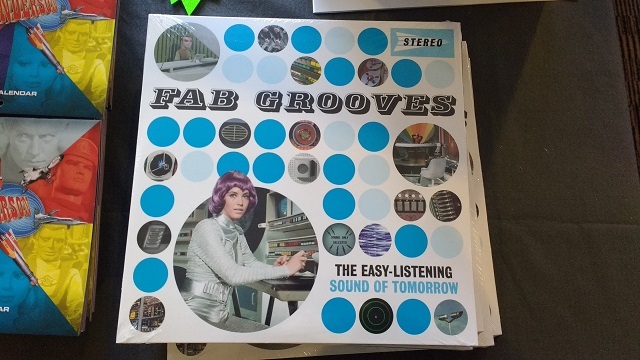 Meanwhile the club surprised fans with no less than 7 new items on sale, but there was one that stood out among all the others – FAB Grooves, a sumptuous double gate-fold LP of Barry Gray ‘easy listening’ tunes, complete with a CD version and full colour booklet. 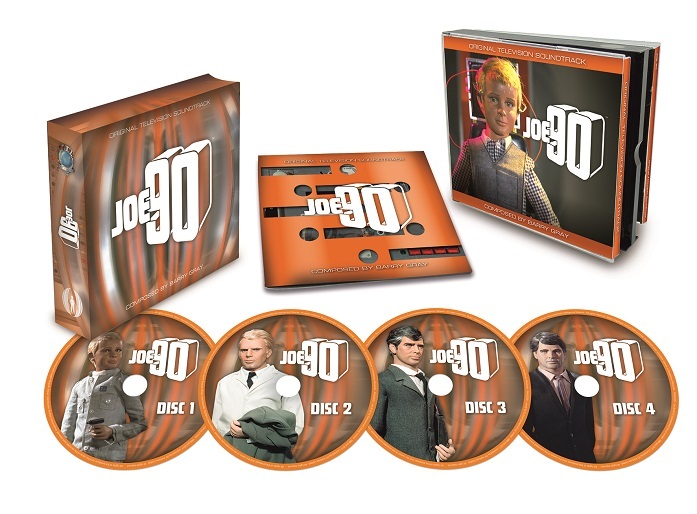 Another closely guarded secret was the release of a 4-disc Joe 90 soundtrack CD, extending the club’s catalogue of Barry Gray music. The club also released a 2018 calendar, Captain Scarlet anniversary and Joe 90 stickers, and complimentary convention books and Spectrum Shade badge. Upstairs on the first floor, fans could sample the LP on a turntable in ‘Ma Doughty’s Listening Lounge’, or request their own choice of music from Fanderson’s soundtracks. Fans could also watch an episode of their favourite series in the Goggleheimer Productions Viewing Theatre, where all-day screenings with a definite Scarlet-theme were the order of the day. Fanderson events are renowned for their model displays, and Special Assignment was no exception, with a wide variety of puppets and models on show, including original Captain Black and Sam Loover puppets. A big thank you to Chris King and all the other model makers for making the ‘Expo 2068’ room such a visual feast for delegates and the local press! The club also decided to provide a designated room for professional Anderson artwork, after taking on feedback from previous events. Artists including Graham Bleathman, Lynn Simpson, Chris Thompson, Mike Trim, Jonathan Baxter and Mike Noble exhibited and gave talks about their amazing work in the ‘Braquasso Gallery’. For those with a slightly more niche interest, a number of workshops were held throughout the weekend in ‘Brains’ Workshop’. Sculptor Matt Buckley from Robert Harrop took a break from the traders’ room to talk about the process of creating figurines, while members of the Puppet Guild including Mary Turner held a session on how to make puppets walk realistically. 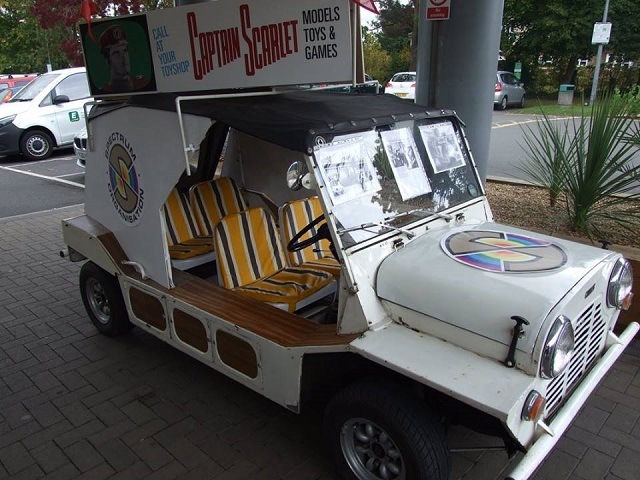 A beautifully restored Mini Moke as used in the promotion of the original Captain Scarlet in the 1960s was on display throughout the weekend outside the hotel main entrance, courtesy of Sam Denham. A camera crew also visited the event on Sunday afternoon to interview fans and capture the atmosphere. On top of all that, delegates raised nearly £2,000 for the convention charities – Orchid and the Cinema And Television Benevolent Fund. So there you have it. Thank you to all the guests, traders, artists, model makers, hotel staff, suppliers, and everyone else who helped make this such a special assignment. Most importantly, thank you to all the club members – both near and far – for your magnificent support for this event. 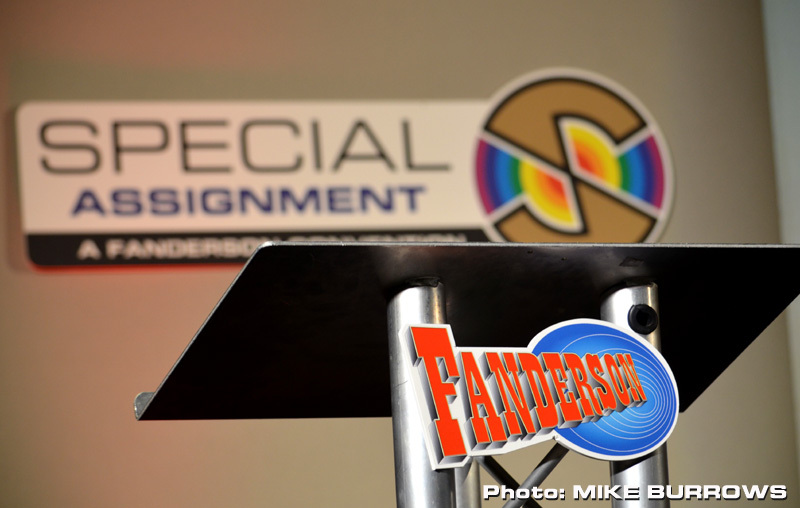 By the time it came to Nick Williams’ closing address there was a real sense that Special Assignment would be remembered as one of the best Fanderson conventions in many years. So, roll on the next one! S.I.G. Over and out.